This recipe is honestly one of my all-time favorite wild turkey recipes to make. The combination of whiskey, orange and honey make for a terrific glaze and compliment the flavor of the turkey to perfection. Because this dish is started by browning the meat on the stovetop and finished in the oven, it ends up with an extremely crispy skin without drying out the meat on the inside. In an ovenproof skillet or Dutch oven, heat two tablespoons of butter over medium-high until it begins to bubble. Sprinkle the skin of the turkey breast with salt and pepper. Place the breast skin-side down into the butter, sprinkle the underside with salt and pepper, and let the skin brown for about 5 minutes. Turn it over and add the stock. Cover with foil or a lid and transfer to the oven. In a separate skillet, melt the 4 tablespoons of butter over medium heat. Whisk in the honey until well incorporated. Add the whiskey along with the orange juice, orange rind and cayenne and whisk together. Set on low heat and let the mixture reduce by half. Turn off the heat and set aside. Once the turkey has cooked for 10 minutes, brush with half of the glaze and cover with the foil. 20 minutes later, brush the remaining glaze on, leave the foil off and increase the temperature to 400 degrees F. Cook for 15 - 20 minutes more, or until the internal temperature reads 140-150 degrees F.
Remove the turkey from the oven. Cover with foil and let sit for 10 minutes before slicing and serving. It’s tough to beat a smoked turkey, especially when it’s been brined and smoked with as many herbs and spices as this recipe. Not only does this brine add so much flavor to the meat, it does an unbelievable job of keeping the bird from drying out on the smoker. Without a doubt a very impressive way to prepare turkey for a dinner party. Combine brine ingredients in a medium saucepan and bring to a boil. Stir to dissolve the salt and sugar. Remove from heat and allow to cool. Once cooled, place the turkey into a vacuum sealer bag, pour the brine over the turkey, then vacuum seal. Refrigerate overnight. Soak wood chips for 30 minutes. Preheat the smoker to 250°F with the water bowl filled. Remove the turkey from the bag, then rinse under cold water for about five minutes to remove excess salt. Place the potatoes, carrots, onions, and garlic into the foil pan. Lay the turkey over the vegetables. Pour the water into the bottom of the pan. Sprinkle in the herbs and orange zest. Once the Smoker is preheated, place the pan of turkey onto a middle rack. Smoke for 3 hours, or until the internal temperature of the turkey is 165°F and the vegetables are soft throughout. Preheat your oven to 400°F. Mix together the sugar and water until uniform. Use a basting brush to completely coat the top of the turkey, as well as the tops of the vegetables. Place into the oven for 10 minutes, or until the glaze has set. Serve. Wild turkey legs and thighs have a bad reputation for being chewy and tough. With birds on the move all day long, they’re bound to be. This recipe absolutely takes care of that problem and uses the meat to create a great lunch taco. Be sure to keep a couple limes and sour cream on hand for a finishing touch! Salt the turkey well and put it into a Dutch oven or large lidded pot, add all the herbs, spices and enough water to just barely cover the meat in the pot. Cover and simmer for 3 to 4 hours, or until the meat is falling off the bone. Don't worry, it will. Eventually. A jake or domestic turkey will be tender in about 90 minutes to 2 hours, and old tom might be double that. My brother Paul visited my Bald Eagle Valley home one day last winter. We were just sitting in the dining room having a cup of coffee. Birds flitted in and out from the bird feeders on my deck — just a few feet from the sliding glass doors and the table where we were seated. We sipped hot java, shared warm conversation and watched the birds interacting outside on the cold deck. "You know, I think that I could be entertained all day just sitting here watching the birds," Paul commented. Although I am a busy person, I spend a good bit of time doing just that — watching the birds. It has been so cold since Christmas that sitting inside with a mug of coffee has often seemed like an excellent idea. Not only do I watch the birds for pleasure, I count and record my observations. I also like to photograph my feathered friends. Beyond the counting are the other interesting bird interactions that I get to experience. Just last week, I watched a female hairy woodpecker pecking at suet in a cage feeder. A female red-bellied woodpecker landed below the hairy, but the hairy did not budge. The next thing I knew, the red-belly jabbed her pointy beak into the side of the hairy woodpecker and the feathers flew. Not surprisingly, the hairy woodpecker flew off to allow the red-belly to feed. I record my counts for Project FeederWatch on eBird and my observations in a journal. Besides being fun for me, this data is valuable to ornithologists and can be used in many ways. What Cornell Lab of Ornithology terms "citizen-science" data has been used in numerous scientific papers. The data documents the rapid southerly movement of irrupting species, such as pine siskins this winter, as well as the long-term population shift of Carolina wrens and red-bellied woodpeckers northward. You can join in on the counting and citizen science during this winter's Great Backyard Bird Count, to be held Feb. 16-19. According to Cornell University, the mid-February timing is selected to coincide with the time when North American bird species are at their southernmost extent. The combined efforts of birders from all over the world will provide a snapshot of bird populations during those four days. That data will help researchers at the Cornell Lab of Ornithology and the National Audubon Society learn more about how different species of birds are faring in our changing environment. The Great Backyard Bird Count continues to grow. In 2015, just over 143,000 volunteers tallied 5,090 species, and in 2017, more than 210,000 participants from more than 140 different countries submitted bird counts. It was the most detailed four-day snapshot of world-wide bird populations ever collected, with counters reporting 5,940 different species. The top five reported birds were the northern cardinal, American crow, mourning dove, dark-eyed junco and the downy woodpecker. Things to watch for in this year's Great Backyard Bird Count will be the extent of the southern movement of siskins, as well as red and white crossbills. It will be interesting to see how this February's pine siskin count compares to 2015. That year, participants counted a record 171,312 pine siskins, compared to only 13,431 in 2014. And this appears to be another big year for the normally Arctic-living snowy owls. You could be lucky and spot one of these magnificent birds. Participating in the count is free, it's fun and anyone can help. The GBBC welcomes birders of all ages and all degrees of expertise. All you need to do is count birds for 15 minutes or more during one or more of the four count days and report your findings online at www.birdcount.org. 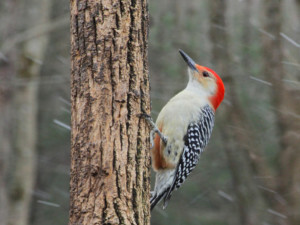 Although the event is called the Great Backyard Bird Count, participants are welcome to count at a park, a state game land or anywhere they wish. Information about the GBBC can be found online and at gbbc.birdsource.org — you can type in a zip code or the name of a park and they will customize printable tally sheets just for that location. "These types of activities provide the citizen-scientist with an opportunity to help wildlife," Game Commission biologist Doug Gross stated. "Anyone who can identify even a few species can contribute to our knowledge (about) the occurrence and abundance of birds in winter." If you are looking for a different mid-winter family activity, the Great Backyard Bird Count is a way to involve everyone in an important conservation effort. It even has an accompanying photo contest. Not only is it free, easy, and fun, but your efforts — however large or small — will help ornithologists and all of us learn more about birds. I've always been passionate about the countryside that I live in, and shoot, hunt and fish within it. But, recently I have found something that tops it all - hunting, shooting and fishing with my daughter, Evie who is three. We go rabbit shooting once a week, she keeps me company when I'm fishing and during the pheasant season she will be getting stuck in on the beating line. "Whenever I get my shotgun, rifle or fishing rod out, there's suddenly a little voice: 'Can I come Daddy?' "
She absolutely loves it and her enthusiasm for what she learns drives me to believe that hunting and fieldsports are something more children should be doing or at least learning about. It's not just about shooting the animal, that's the least important part, it's about nature, conservation and importantly knowing where your food comes from. Evie can tell you where rabbits live, why we shoot them and that we then eat them. She can also name you different types of trees and birds, she could show you a fox hole or a deer slot. Her face absolutely lit up when we were laying waiting for deer and bats started hunting just above our heads. "Shooting the animal is the least important part, it's about nature, conservation and knowing where your food comes from." Because I've explained to her about closed season for deer, pheasant and other game she knows that we don't shoot them because that's when they have young (or babies as she terms it!). She is three and she knows more than some adults I've met! All of this has stemmed from shooting - this lead to a natural curiosity for the outside world which I think sometimes the children of today are lacking. Children are the future of not only fieldsports, but every walk of life that relates to it and every minute invested in them will only be repaid over and again. For me though the best thing is whenever I get my shotgun, rifle or fishing rod out and start pulling my boots on , there's suddenly a little voice: "Can I come Daddy?" If you haven't stood around a white-hot bed of coals with your favorite beverage in hand, watching a sizzling grill full of bacon-wrapped duck, you've missed out on something. Even those misguided souls who have decided that eating duck just isn't their thing will change their minds with the first bite of a marinated piece of breast meat snugly encased in crispy bacon. Over the years, I've probably eaten close to a pickup load of bacon-wrapped game. Too much of a good thing can be bad, at least as far as your physical health is concerned. Lately, I've switched from bacon to leaner, thinly sliced cured pork products like prosciutto or pancetta to give me that salty, crisp flavor and texture, but with about half the calories and fat. To make this appetizer more interesting, I've inserted a slice of mango and jalapeño to give it a firm, semisweet bite. If mango is not readily available or is out of season, try it with a slice of apple, pear, or pineapple. The duck has just enough time in the marinade to enhance, not disguise, the flavor of the meat—so it will still taste like duck. Most people can eat several of these tasty appetizers. Allow at least 4 or 5 per person. This recipe makes 24 pieces, or about 6 portions. To prepare the marinade, whisk together all the ingredients except olive oil in a large, nonreactive bowl until well blended. While whisking, add the olive oil in a thin stream until emulsified. Add the sliced duck, cover, and refrigerate 2 to 4 hours, turning occasionally. Place the jalapeño peppers on a cutting surface and slice 4 pieces lengthwise from the outside. This will eliminate splitting and scraping seeds away. When you're done with each pepper, you should have 4 seed-free jalapeño slices plus the stem section with the ribs and seeds attached. If you prefer your duck on the spicy side, add some of the seeds to the marinade. Remove the duck strips from the marinade and drain. Lay prosciutto slices on a work surface. Place a strip of jalapeño, then mango, and finally duck across one end of the prosciutto. Roll the prosciutto up and over the duck, jalapeño, and mango while keeping it snug with your fingers. Secure with a toothpick. Cook evenly on a hot grill, cast-iron skillet, or broiler until lightly browned on all sides (for about 7 to 9 minutes total). If your taste buds prefer something spicier, this marinade should do the trick. It works with the same recipe and makes enough for about 3 to 4 cups of duck breast fillets. Combine all the ingredients and mix well, then toss together with the fillets. Cover and refrigerate 6 to 24 hours. The season for morel mushrooms is frighteningly short. You pick 'em, eat 'em, and they're gone. Here's how to preserve them for great eating all year. Part of the reason that morel mushrooms are so coveted is that they appear for only a brief time each spring, and then they disappear again until next year. But wouldn't it be great to be able to enjoy them at virtually any time of the year? Here's a way to preserve them that keeps that great morel mushroom flavor intact. Of course many folks dehydrate morels - I do - and that's a great way to preserve them. But Josh Payne shows Shawn Bailey a different method of preserving the "American truffle" that he claims maintains at least 25% more of that great morel flavor than dehydrating. Plus they maintain their size! First, cut the morels in half and soak them in salt water overnight to release the little creepy crawlies that inhabit the mushrooms. Then take some flour that is seasoned with whatever kind of seasoning you prefer, even just salt and pepper, and place it in a plastic bag. Remove the morels from their salt bath and drop them into the bag of seasoned flour. Shake gently to thoroughly coat the mushrooms with flour. Place them on a baking sheet and pop in the freezer. Once they're frozen simply take them out and place in a ziplock baggie and pop them back in the freezer for longterm storage. The flour helps keep them from sticking to each other or the baggie, and all you need to do to prepare them is fry them in butter or use them however you would fresh morels. I'm going to take a portion of my morels - they're still blooming in my neck of the woods up north - and give this preservation method a try. Page created in 5.765 seconds with 34 queries.